This counter is the hub of my home. It is open to the kitchen, dining room, office, and living room. You can’t miss it when you walk into my house from either the front or back doors. Because I am a normal person who uses my kitchen counter for things like cooking, working, eating, projects, and unloading groceries, it can get to looking messy… like yours, too, perhaps? And, because it’s big, it can become a big mess if I let it! How do I deal with clutter? Whenever my tolerance for clutter has been exceeded (daily or weekly, depending on how busy I am, what project is being left out to work on, and what else is going on in my life) — or, when someone calls and says they’re coming over in 10 minutes — I simply de-clutter. I don’t panic, because I’m organized; I know everything has a home, and it only takes a few minutes to put everything away where it belongs. I use the S.P.A.C.E. organizing method with clients, and at home, too! Putting away the things you’ve gotten out to use during the day is part of the Equalize step. Why do I tell you these things? Because I don’t want you to think I’m some sort of super-human being who can’t relate to your clutter and organizing challenges. Because I want you to know how much easier it can be to live a normal life and maintain a clutter-free living space if you have a system in place that you trust because it works for you. You must be pretty rigid in your ways because you are a former engineer who uses the word system. Hmmm…what do you think I mean by system? I guess I don’t really know. Well, let me ask you this: Do you have a place where you put your purse and your keys every day so you can find them again later? Well, that’s a system! It’s a system for being able to find your purse and your keys every day! Oh, OK. I hadn’t thought of it that way. What is your system for keeping clutter at bay? For company dropping by? If you need some ideas, check out my Six Organizing Systems Everyone Needs series. And How Clean Does Your House Really Need to Be? Is your kitchen counter messier than mine? Please share in the comments below! Copyright 2014-2018 by Hazel Thornton, Organized For Life. Wanna see my kitchen pantry? 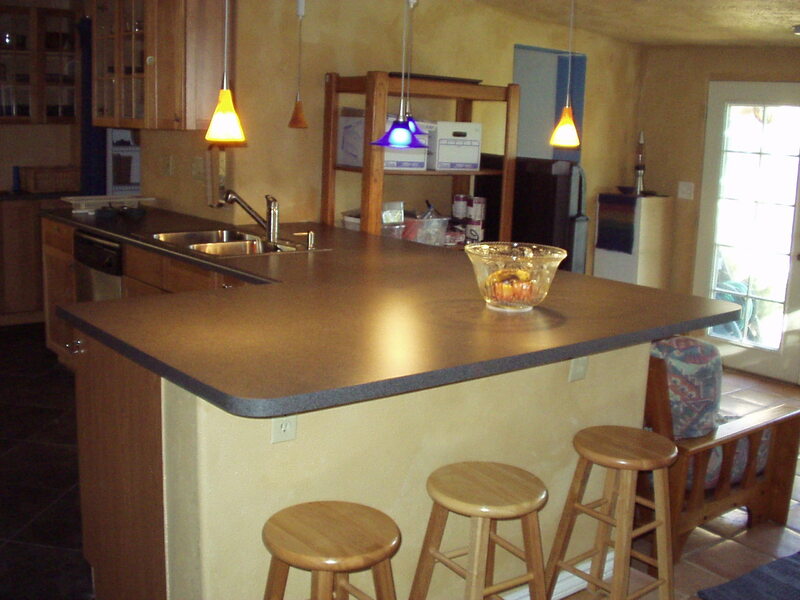 I have an idea for keeping clutter of my kitchen counters. I can hire you to stand in the kitchen with a bayonette and threaten my husband and kids (and me, if I am really honest). This might work! Thankfully the kids are almost gone, and maybe I can cajole (nag) my husband into putting dishes in the dishwasher and everything away when he is done with it. I suspect I am living in a dreamworld, but who knows, maybe it will happen. Ha ha, Chris…I could do that, yes, but I have a cheaper solution for you than employing me full time: Blue painter’s tape (any color, really). I have been known to mark sections of clients’ counters, and other surfaces. with cross-hatchings of tape indicating, “Don’t put anything here.” It’s usually temporary, for creating a new habit. (Who wants their counter permanently marked with blue tape?) Before you do that, though, you need to determine what you actually use every day (it can stay out on the counter), what can be stored elsewhere, where to put a “corral the clutter” basket, and what areas you REALLY would like to keep clear. Let me know it you try it, OK? Hi Nancy! Yes, let me know how it goes for you. I’ll also contact you via email. One advantage of having a sadly small kitchen is that you have to keep the counter tidy! Otherwise there’s nowhere to make coffee, prepare meals, or stack the dirty dishes. Yes, the same principles apply, but you certainly can’t leave any projects out on a tiny counter! I’m a big fan of the SPACE method too! I’ve used it in countless presentations over the years. I do a nightly kitchen counter pick-up before bed and it makes my mornings run so much smoother. Thanks for the great post – pinned it! I do enjoy waking up in the morning to a clean counter when I have cleared it the night before! As for SPACE, I notice other organizers coming up with their own systems, but, well, it works for me. Why reinvent the wheel? My kitchen counter is the center of our home. It’s large and accessible from many angles and it’s always covered with stuff!! Especially my husband’s stuff because that is his home base to put his wallet, race gear, car parts…..not my favorite storage plan. I work hard to keep it somewhat clear. I have a basket for mail and paperwork but it needs to be cleaned out. All of my husband’s stuff gets consolidated on a regular basis to one end of the bar. I’m terrible of doing dishes in a timely manner but in the last 2 weeks I’ve been making a very concerted effort to keep the dishes done and immediately put dirty ones in the dish washer. Working a home I always think, I can do that later, now I need to work. But it literally takes less than a minute or two and I’m ALWAYS happier afterwards. When I was doing a lot of filming in my house, I loved when my kitchen was camera-ready, but that’s too unrealistic for real life. I try to be realistic and allow a little clutter in my life. Like you, I can tidy up pretty quickly because I do have systems in place. Thanks for sharing a glimpse inside your kitchen! I, too, struggle with dishes. But why? Like you said, it doesn’t take long, and the benefits are huge! One aspect of my system is to leave five minutes before I leave for the day to “reset” my space. I bring things out to the kitchen counter to work as well, but I do try and put it back before I take off. I tell myself that I want to feel “welcomed home” when I come back in, and it makes me feel calm to know that the space will be ready to go if I need to dive right in. What a great piece! It’s so funny that one of the questions I get asked most is “how do you keep your home so clean and organized?” My answer is always that I have three young kids and a busy life and tings get messy. But because I have a place for everything and a system that we follow when it is time to clean up it’s pretty easy! The point you made about having systems but not necessarily having everything “pristine” and clutter-free all the time is so key. When we’re working or things are in progress, there will be a mess. We need to have things out so we can work on them. Think about cooking and all the ingredients that get pulled out of the refrigerator and cabinets in order to make a meal. But if there is a system (as you’ve suggested,) then after the meal is done, things can go back to their homes and the kitchen can return to it’s calmer state. We live in a state of flux….from chaos to calm and back again. This shows we (organizers) are human. We create messes, just like everyone else, in our daily activities, but having a system to “right the ship” is what keeps us organized. thanks Hazel.